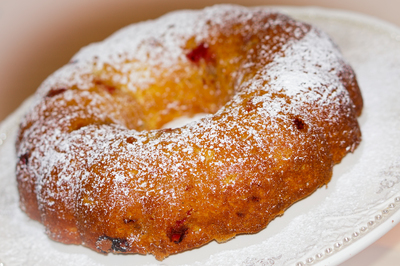 Preheat oven to 170 C and grease a bundt pan with melted butter and a light dusting of flour. Beat butter, cream cheese and lemon together until creamy. Add in sugar and mix together. Sift flours over mixture and fold until JUST combined. Gently fold in cranberries. Pour mixture in to prepared bundt tin and smooth out evenly with a spatula. Bake in the oven for 60 minutes but check on your oven as times will vary. Mine baked a lot quicker than the time suggested so I took it out at 50 minutes but when a skewer comes out clean or with few crumbs attached, the cake is ready. 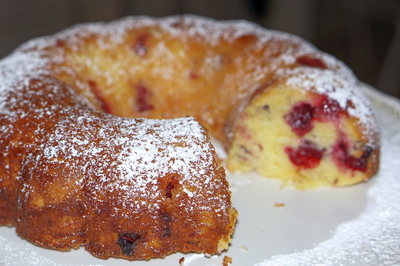 Leave cake to cool in bundt pan before turning out.